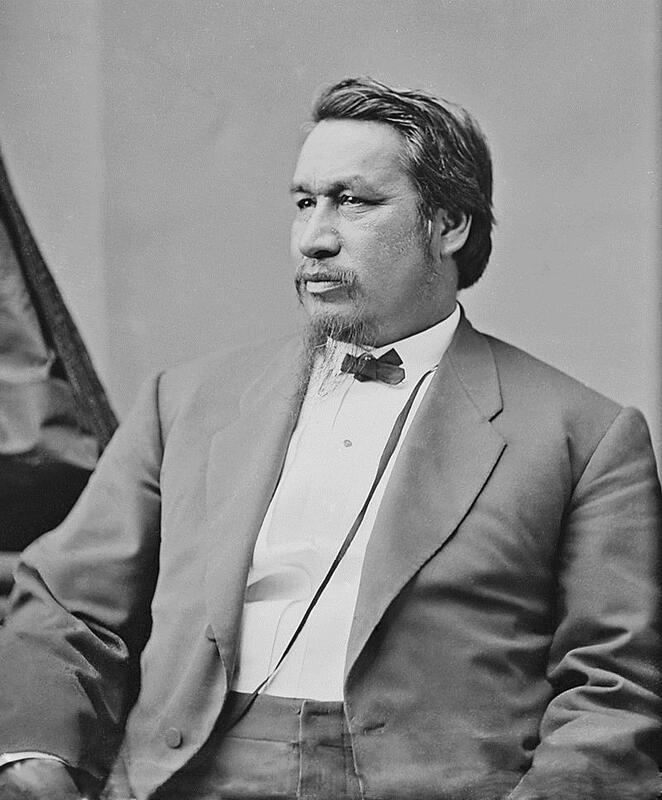 Ely Samuel Parker (1828 – August 31, 1895), (born Hasanoanda, later known as Donehogawa) was a Seneca attorney, engineer, and tribal diplomat. He was commissioned a lieutenant colonel during the American Civil War, when he served as adjutant to General Ulysses S. Grant. He wrote the final draft of the Confederate surrender terms at Appomattox. Later in his career, Parker rose to the rank of Brevet Brigadier General, one of only two Native Americans to earn a general’s rank during the war. President Grant appointed him as Commissioner of Indian Affairs, the first Native American to hold that post. He served as Chief of the six Iroquois Nations, consisting of the Tuscaroras, Cayugas, Senecas, Mohawks, Oneidas, and Onondagas. Parker was born in 1828 as the sixth of seven children to William and Elizabeth Parker, of prominent Seneca families, at Indian Falls, New York (then part of the Tonawanda Reservation). He was named Ha-sa-no-an-da and later baptized Ely Samuel Parker. His father was a miller and a Baptist minister. Ely had a classical education at a missionary school, was fully bilingual, and went on to college. The parents strongly supported education for all the children, who included Spencer Houghton Cone, Nicholson Henry, Levi, Caroline (Carrie), Newton, and Solomon. Nicholson Parker also became a prominent Seneca leader as he was a powerful orator. Parker married Minnie Orton Sackett (1849–1932) in 1867. They had one daughter, Maud Theresa (1878–1956). 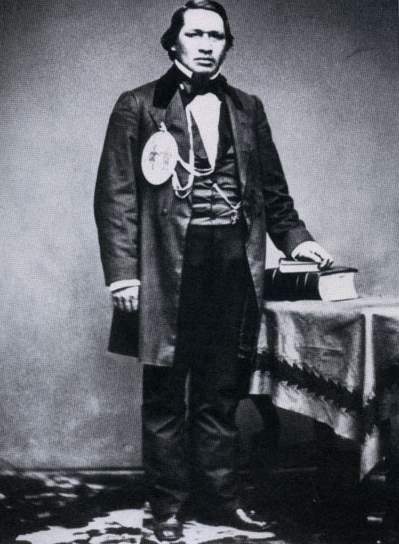 Parker began his career in public service by working as an interpreter and diplomat to the Seneca chiefs in their negotiations about land and treaty rights, in 1852 Parker was made sachem of the Seneca, and given the name Donehogawa, “Keeper of the Western Door of the Long House of the Iroquois”. Parker attended Rensselaer Polytechnic Institute, graduating as an engineer. As an engineer, Parker contributed to upgrades and maintenance of the Erie Canal, among other projects. As a supervisor of government projects in Galena, Illinois, he befriended Ulysses S. Grant, forming a strong and collegial relationship. Near the start of the Civil War, Parker tried to raise a regiment of Iroquois volunteers to fight for the Union, but was turned down by New York Governor Edwin D. Morgan. He then sought to join the Union Army as an engineer, but was told by Secretary of War Simon Cameron that as an Indian, he could not join. Parker contacted his colleague and friend Ulysses S. Grant, whose forces suffered from a shortage of engineers. Parker was commissioned a captain in May 1863 and ordered to report to Brig. Gen. John Eugene Smith. Smith appointed Parker as the chief engineer of his 7th Division during the siege of Vicksburg, and later said Parker was a “good engineer”. When Ulysses S. Grant became commander of the Military Division of the Mississippi, Parker became his adjutant during the Chattanooga Campaign. He was subsequently transferred with Grant as the adjutant of the U.S. Army headquarters and served Grant through the Overland Campaign and the Siege of Petersburg. At Petersburg, Parker was appointed as the military secretary to Grant, with the rank of lieutenant colonel. He wrote much of Grant’s correspondence. Parker was present when Confederate general Robert E. Lee surrendered at Appomattox Courthouse in April 1865. He helped draft the surrender documents, which are in his handwriting. At the time of surrender, General Lee “stared at me for a moment,” said Parker to more than one of his friends and relatives, “He extended his hand and said, ‘I am glad to see one real American here.’ I shook his hand and said, ‘We are all Americans.’ Parker was brevetted brigadier general of United States Volunteers on April 9, 1865, and of United States Army March 2, 1867. 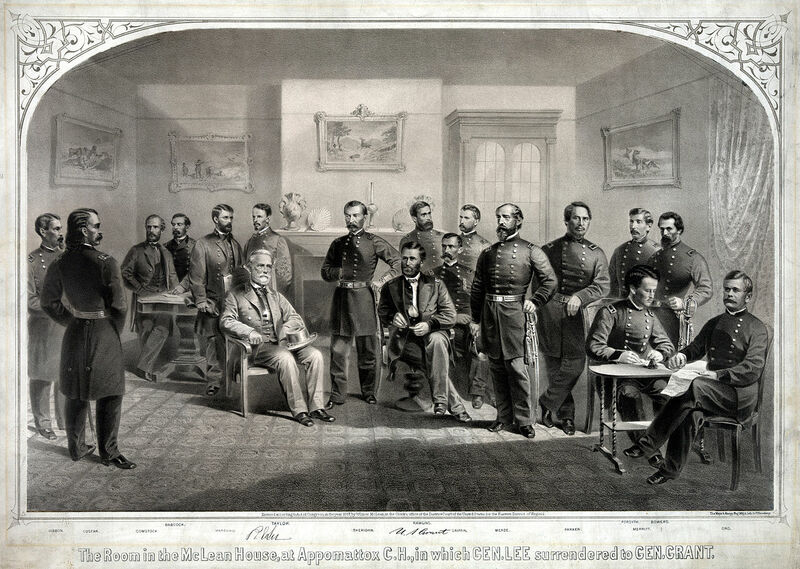 Parker is the third from right, back row, at the surrender of Appomattox. 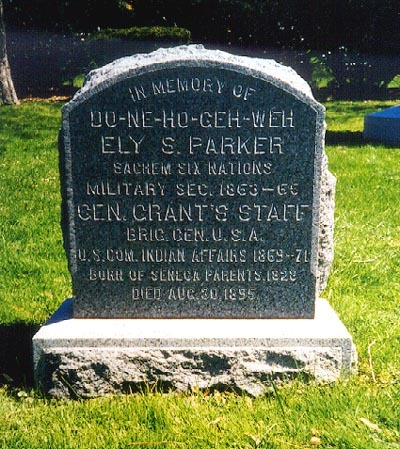 Parker was one of only two Native Americans on either side of the Civil War to rise to a brigadier general’s rank. The other was Stand Watie, a Cherokee who fought on the Confederate side. After the Civil War, Parker was commissioned as an officer in the 2nd United States Cavalry on July 1, 1866. He again became the military secretary to Grant as he finished out his time as general in chief. Parker was a member of the Southern Treaty Commission that renegotiated treaties with Indian Tribes that sided with the Confederacy. Parker resigned from the army with the brevet rank of brigadier general of Regulars on April 26, 1869. In 1869 President Grant astounded the nation by appointing him commissioner of Indian affairs, a post never before deemed suitable for an Indian. He served in that post until 1871. Parker became the chief architect of President Grant’s Peace Policy in relation to the Native Americans in the West. Under his leadership, the number of military actions against Indians were reduced in the west. 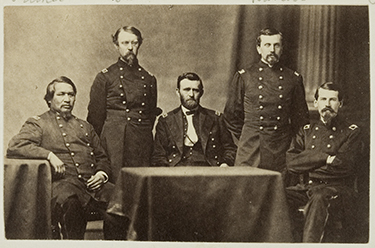 Parker, seated at left, with Ulysses S. Grant, above. Beset both by corrupt profiteers and overzealous churchmen, he was investigated by the House of Representatives. Exonerated, he resigned in sorrow and attempted a career in business, in which he was not successful. Parker lived his last years in poverty, dying in Fairfield, Connecticut on August 31, 1895, where he was buried. He left his widow with no income and few possessions; those included, however, one of the valuable manifold (carbon) copies of the surrender he had written at Appomattox. The Seneca did not feel Algonquin territory was appropriate for a final resting place, and requested that his widow relocate the grave. On January 20, 1897, Ely Parker’s body was exhumed and moved to Forest Lawn Cemetery in Buffalo, New York. He was reinterred next to his ancestor Red Jacket, a famous Seneca orator, and other Native people such as Little Billy, Young King, Tall Peter, Destroy Town, and Louis Bennett, also known as Deerfoot. Above, Ely Parker’s stone at Find-A-Grave. This entry was posted in Cayuga, Military, Mohawk, Oneida, Onondaga, Seneca, Tuscarora. Bookmark the permalink. Great History….Many thanks. Have you ever considered some of the early Choctaw History…the only known tribe which never lifted a sword to the stars and stripes.